A pollutant is a substance or energy introduced into the environment that has undesired effects, or adversely affects the usefulness of a resource. A pollutant may cause long- or short-term damage by changing the growth rate of plant or animal species, or by interfering with human amenities, comfort, health, or property values (wikipedia.com). Most cases of non-point source pollution exemplify well the intractable ethical problem of the “tragedy of the commons”. That is to say, an individual polluting a common resource suffers little themselves from their own pollution and yet may benefit considerably in other ways. In this unit you will understand the concept of pollution, how pollution is formed, pollution management strategies, This unit is 2.5 hour. 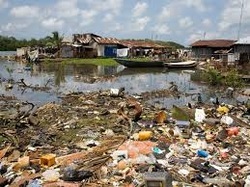 Pollution is a highly diverse phenomenon of human disturbance in ecosystems. How can systems diagrams be used to show the impact of pollution on environmental and social systems? 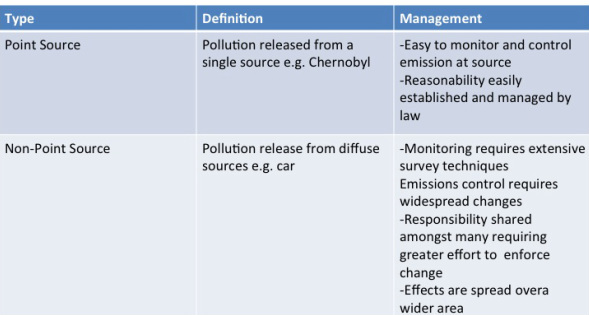 How do EVSs influence the choice and implementation of pollution management strategy? 1.5.U1 Pollution is the addition of a substance or an agent to an environment through human activity, at a rate greater than that at which it can be rendered harmless by the environment, and which has an appreciable effect on the organisms in the environment. Pollution is the release into the environmental of a substance or an agent by human activities at a rate at which in cannot be rendered harmless. Pollution can be natural, deliberate or may be accidental. It includes the release of substances that affect air, water and soil, and which reduces human quality of life. 1.5.U2 Pollutants may be in the form of organic or inorganic substances, light, sound or thermal energy, biological agents or invasive species, and may derive from a wide range of human activities including the combustion of fossil fuels. Sources of pollutants are combustion of fossil fuels, domestic and industrial waste, manufacturing and agricultural systems. 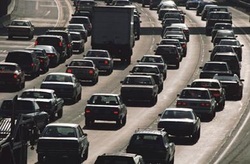 U 1.5.3 Pollution may be non-point or point source, persistent or biodegradable, acute or chronic. Point source pollution is generally more easily managed because its impact is more localized, making it easier to control emission, attribute responsibility and take legal action. Organic compounds that do not break down in the environmental through chemical, biological, and light processes. Because of their persistence, POPs bioaccumulate with potential significant impacts on human health and the environment. The effect of POPs on human and environmental health was discussed, with intention to eliminate or severely restrict their production, by the international community at the Stockholm Convention on Persistent Organic Pollutants in 2001. Decay or breakdown of pollution that occurs when microorganisms use an organic substance as a source of carbon and energy. The products are rendered harmless by natural processes and so causes no permanent harm. Pollution of significance which occurs suddenly and should take into account worst case discharge scenario from the facility. Typical examples are larger oil spill due to pipe rupture or a blow out from a well. A persistent release of a pollutant at a low concentration resulting in adverse effects on animal or human body with symptoms that develop slowly, due to long and continuous exposure to low concentrations of a hazardous substance. Such symptoms do not usually subside when the exposure stops. 1.5.U4 Pollutants may be primary (active on emission) or secondary (arising from primary pollutants undergoing physical or chemical change). Pollutants are classified as primary or secondary based on their characteristics while they are emitted and physical/chemical changes they undergo while in the environment. The pollutants emitted into the environment directly from the identifiable sources and remains unchanged within that environment are known as primary pollutants. The pollutants which undergo chemical changes in the environment as a result of reactions among two or more pollutants are called secondary pollutants. The pollutants like sulphur dioxide, nitrogen dioxide and particulates are recognized as primary pollutants while several other air pollutants are categorized as secondary pollutants. 1.5.U5 Dichlorodiphenyltrichloroethane (DDT) exemplifies a conflict between the utility of a “pollutant” and its effect on the environment. DDT was developed as the first of the modern synthetic insecticides in the 1940s. It was initially used with great effect to combat malaria, typhus, and the other insect-borne human diseases among both military and civilian populations and for insect control in crop and livestock production, institutions, homes, and gardens. quick success led to the development of resistance by many insect pest species. Her work attracted outrage from the pesticide industry and others. Her credibility as a scientist was attacked, and she was derided as “hysterical,” despite her fact-based assertions and calm and scholarly demeanor. Following the hearings, President Kennedy convened a committee to review the evidence Carson presented. The committee's review completely vindicating her findings. The use of DDT for malaria has many pros and cons that cause environmentalists, health organizations, and governments to fall on either side of the fence. The main questions to ask in this nuanced argument is whether the long-term health and ecological impacts of DDT outweigh the health benefits of DDT for malaria, and whether there are alternatives that might work better at lower cost. Change the human activity that generates the pollutant in the first place. Minimize the amount of the pollutant released into the environment. Clean up the pollutant and the affected areas after the pollutant has been released. Using Figure 3 show the value and limitations of each of the three different levels of intervention. Appreciate the advantages of employing the earlier strategies over the later ones and the importance of collaboration in the effective management of pollution. Pollution management depends on all of the individuals involved. If there are associated costs then it becomes harder to persuade people of the benefits of pollution management. In many LEDC's, limited infrastructures such as the removal of domestic waste can become a major issue. Societies awareness of problems and cultural acceptances can also impact pollution management. Cultural values, political systems and economic systems will influence the choice of pollution management strategies and their effective implementation. Real examples should be considered. Cultural factors: if society adopts an 'out of sight, out of mind' approaches then individuals would be more likely to dispose pollution in a more hazardous way. You need to be able to evaluate the effectiveness of each of the three different levels of intervention. 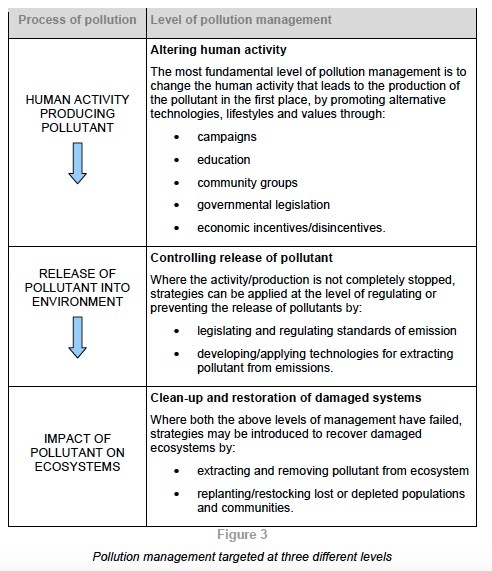 The principles of this figure should be use through the course when addressing issues of pollution. You should appreciate the advantages of employing the earlier strategies of pollution management over the later ones, and the importance of collaboration. 1.5.A2 Evaluate the uses of DDT. 1.5.S1 Construct systems diagrams to show the impact of pollutants. Process outputs, which include products or services, air emissions, noise, odor, radiation, wastewater discharges, solid waste, and hazardous wastes. Experts sometimes disagree about pollution management strategies—on what basis might we decide between the judgments of the experts if they disagree? Around the globe, scientists are racing to solve a series of mysteries. Unsettling transformations are sweeping across the planet, and clue by clue, investigators around the world are assembling a new picture of Earth, discovering ways that seemingly disparate events are connected. The Story of Cap & Trade is a fast-paced, fact-filled look at the leading climate solution being discussed at Copenhagen and on Capitol Hill. Host Annie Leonard introduces the energy traders and Wall Street financiers at the heart of this scheme and reveals the "devils in the details" in current cap and trade proposals. Historical clips on DDT, Rachel Carson and science explaining why humans pollute. It's a chemical which started the debate over ill effects of pesticides and insecticides on human health years back. But the hard fact is that most controversial Persistent Organic Pollutant DDT , which is banned by almost every country in the world is still being used widely in India. Infact, even after having credible scientific evidences of its ill impact on ecology and human health, India is the only country manufacturing this pesticide.